Eton Mess, a traditional British dessert, consists of meringue, strawberries and cream. It is served traditionally at Elton College on 4th June. Meringue: store bought or home made the day before. Lay a baking tray with parchment paper, or butter it. Whip egg white with medium speed until stiff peak formed. Add sugar slowly and salt while continue whisking. Turn up to high speed, add vanilla and whisk a bout 7-8 minutes. The meringue will be smooth and glossy. Spoon or pipe the mixture onto the prepared pan. Bake at 200 oF for 1 hour or turn the oven to 450 and put it in then turn off the oven and let them cools and dry in oven overnight. Then break them in pieces. 1 lb fresh strawberries or mixed berries , banana, etc. Wash and hull strawberries, pure 1/3 and cut 2/3 into bite sizes, save some wholes for decoration. Combine pureed and sliced strawberries with 2 Tbs sugar for at least one hour. Mix gelatin with 1 Tbs water, warm it up in microwave about 10-15 seconds for the gelatin dissolved. Mix cream, sugar, and vanilla in a bowl, cover and refrigerate at least 30 minutes. Whip until stiff formed, add gelatin, whisk well. Cover and store in the fridge. Skip gelatin step if serve right away. Fold the whipped cream with meringue. 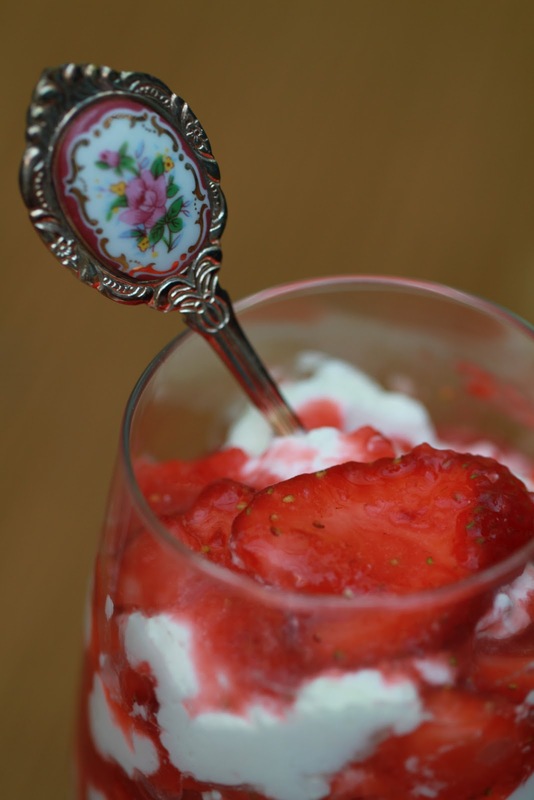 Place a layer of mixed cream into a glass, then a layer of strawberries, continue until full top with whole strawberries. Serves immediately.